On one front the improving quality of the smartphone camera has been contributing year-on-year to a global decline in digital camera sales since 2011. On a second front the main competition (Nikon) was closing the market share gap by outspending Canon 2 to 1. And, with the most photographed holiday season (Christmas) approaching Canon needed a way to cut through all the marketing noise at their busiest time of year. Instead of adding to the noise our idea was designed to create a conversation by playing to the true values (tradition, giving and connecting) of Christmas and flipping the most popular style of photograph – the selfie. 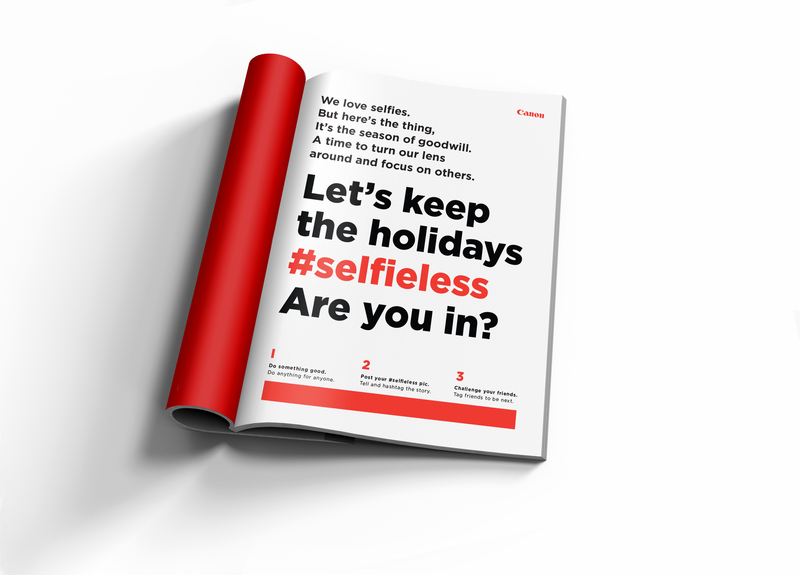 #selfieless challenged a self-obsessed planet (who take 93 million selfies a day) to switch the focus away from themselves and focus on the needs of others. In the season of goodwill Canon’s message would be to flip the camera around and do some good for someone else, then challenge friends to do the same. And instead of trying to outspend the competition Canon would also donate over €1 million to the Red Cross.